Store and transport essential fresh water for drinking, cooking and more. Built-to-last construction, with an easy-fill, easy-pour design for convenience. 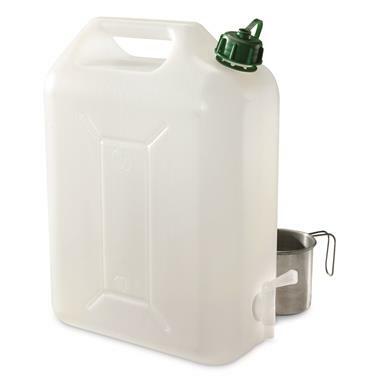 10 Liter Dimensions: 11 x 5.75 x 15"h.
20 Liter Dimensions: 14 x 5.75 x 17.5"h.
British Municipal Surplus Water Can with Spout, Like New is rated 5.0 out of 5 by 2. Rated 5 out of 5 by Kevin from Well made I purchased the 10 liter size to have a smaller water container than the normal 5 gallon or 20 liters. This fits the bill perfectly, the spout is simple but made well and doesn't look like it will break easily as is the case with other water containers. Rated 5 out of 5 by David from Just What I Wanted I wanted portable water containers for emergencies at home. At just over 5 gallons, these fit the bill. The spigot is effective but not so rugged that I'd trust it not to leak during the rigors of camping. But for emergency water to sit on the counter sink-side, these are just what I wanted! I'm probably gonna buy some more!